Passive investments have been available to institutional investors through index funds or other beta vehicles for many years. With the spread of ETFs as the beta vehicle of choice in the last years, the debate on active vs. passive investing gathered extensive attention. The arguments most often mentioned for passive investing are increased diversification and low costs. Previously, small investors that shy away from active fund selection, had to accept a portfolio with only a few positions due to portfolio size and transaction costs. Now, with only two ETF positions and without selecting a portfolio manager, these investors can have diversified global stock and bond market exposure. Larger investors benefit from lower costs. Costs from operating a passive strategy are lower compared to an active strategy. Active strategies have to be monitored which can also be costly and the payoff (outperforming a passive vehicle) is uncertain. In contrast, good arguments for active management exist. Active strategies have a chance to outperform the market. Further, a fundamental philosophy and other strategy characteristics that investors might share underlies the active investment process, while for passive investments the investor has to accept what the market delivers in terms of return and risk. Of course, the full list of arguments for both camps is much longer and borders become more blurred. Unfortunately, both camps have good arguments on their side. Let us take a closer look on the commonly accepted definition of “active”. With active investing supporters argue for deviating from a benchmark through an active decision. These decisions can be as simple as weighting stocks in a portfolio equally as compared to weighting by market capitalization. It can also be as complex as leaving out certain industries, overweight single stocks from the remaining industries and rebalance frequently or when fixed price returns are reached. A stock picking strategy can be exactly this. Today, reality is that all liquid strategies which follow rules can be incorporated into fully systematic (or call it automatic) vehicles. We saw the rise of sector ETFs and more recently ETFs that represent styles like growth or value. You can choose between global emerging market sectors, dividend stock portfolios, equally weighted US large cap stocks and fundamentally weighted bond ETFs. Smart beta is one of most famous terms for some new passive strategies. It starts getting mysterious when a growing group of investors begins to invest in smart beta strategies against their (former) believe in a common and in academics still widely accepted theoretical framework. Talking about minimum volatility strategies, backtesting over long horizons might show outperformance and more than one academic paper might argue for the effect, still it is inconsistent with CAPM. Even stronger conviction among investors seems to exist for equal weighting compared to market capitalization weighting. Here, small cap stocks receive higher weights. Therefore, the main driver (rebalancing plays a role, too) is outperformance of small vs. large cap stocks. Case Study: The chart exhibits the performance of an equal-weight (EW) ETF on US Stocks and a market cap-weight (MCW) ETF on the same universe. 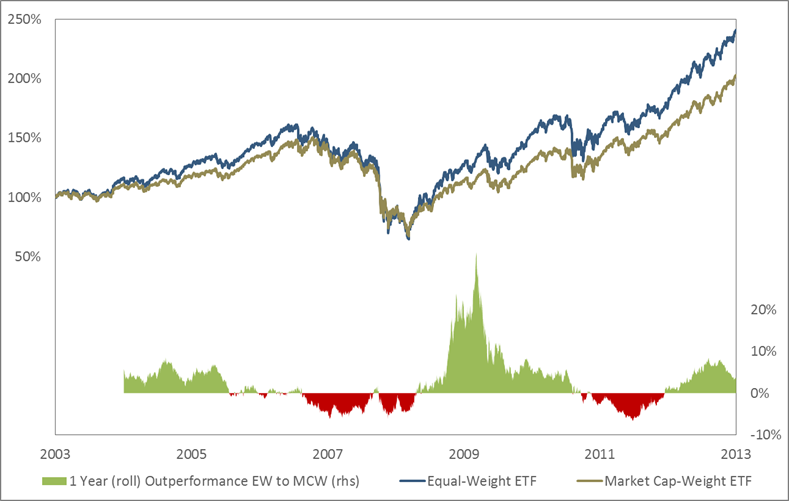 At first glance, the EW-ETF clearly dominates the MCW-ETF. Aggregate return is higher and the drawdowns seem to be on a similar level. The lower part of the chart measures the one year rolling outperformance of the EW- vs. MCW-ETF. Between 2004 and 2009 the annual outperformance was 0.1%, while three out of the five calendar years showed underperformance. 2009 was outstanding with significantly better performance for the EW ETF. It provides 80% of the outperformance over the ten year period observed. Leaving out 2009 (just a thought experiment) paints a different picture. The maximum drawdown is higher for the EW ETF, the return is a bit higher but Sharpe ratios are equal. This does not sound like a sustainable structural outperformance concept. A timing or momentum strategy might be more advantageous here. Investors can easily omit that smart beta strategies might just have outperformed because not enough market participants exploited the underlying effect in the past. We are wondering how many smart beta buyers anticipate or even stress test the ability of a certain approach to continuously outperform with a scenario of more investors exploiting the effect. Such exploitation can also happen without purpose. Take hedging for example. To hedge equity market exposure, the largest and most liquid indices are the hedging vehicles of choice. In most cases, these consist of market cap weighted large cap stocks, like the S&P 500. If the long portfolio consists of stocks with smaller market capitalizations or only leaves out the technology sector (average market cap is very high), the investor will be riding the small cap outperformance wave, probably without knowing it. In no way we want to demonize smart beta or passive investing in general. We believe it is a good development to have more choice and easily build exposure through such vehicles. Instead, we believe it is important to be careful in selecting a passive or any other rule based single-factor strategy, and to be clear about the assumptions inherited. Without taking a deeper insight, these strategies cannot serve as a panacea, but are only deviations from established market indices. For years now, the trend of investors demanding systematic investment processes is unbroken. In the past, managers could convince investors to commit assets on the foundation of their experience, past performance and explanation for past decisions. With the exception of a few, today investment managers are required to provide a detailed systematic investment approach that leaves no room for discretionary decision-making. Investment processes become reproducible because investors expect to better estimate the return and risk characteristics of the manager’s strategy based on historically observed characteristics. Investors that lace such a corset are definitely not enthusiastic when managers change their strategies and it gets worse when changes are implemented without informing investors upfront. Often assessed as a style shift, this triggers an alarm at investor’s risk management departments. It is likely the manager will lose clients. 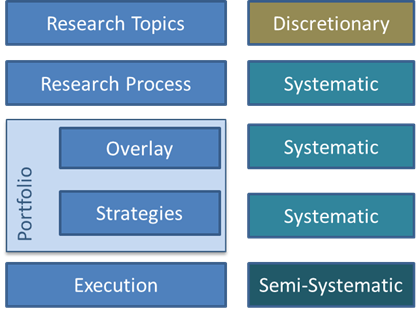 Example of a coherent systematic investment framework for a global macro strategy or even a multi strategy approach on global equities that can be communicated to investors upfront. Together with the investment story and the investment universe, it provides a reliable corset demanded by investors and still leaves enough room for the manager to improve strategies, develop new ones and change portfolio composition. Portfolio managers that offer certain strategies welcomed by investors can live with that tight corset, provided they communicated the right investment goals. An example might be a manager that selects undervalued stocks according to value criteria and only communicated this without stating a target return. Investors know what characteristics to expect and protect against temporary underperformance. Does the manager state a return target like annual positive returns or beating a benchmark, he will be forced to build the mentioned systematic framework and needs to present a more flexible, adaptive approach to satisfy investor’s expectations. The solution is to build a systematic framework that allows for continuous strategy improvements or the addition and replacement of strategies. From this activity of permanent research, development and improvement, we derive the definition of “active management”. The consequences are clear. We see “active” as the process, while “passive” can be a vehicle to implement the strategies. Challenges are manifold. The biggest trade-off is between freedom within the framework to continuously develop and on the other hand to communicate a clear set of return-risk characteristics and a coherent story to investors upfront. The silver bullet is a systematic framework that does not rely on explicit forecasts. It can be an emotional challenge for portfolio managers to accept that forecasting skills are not given and therefore do not add any value. When the manager agrees with this fact, he builds a portfolio that consists of several strategies that exhibit different characteristics and drivers of return. Poor performance of one or more strategies can be balanced out through this diversification. Intentionally, we speak about several strategies instead of several asset classes. A combination of strategies with different underlying assumptions, implemented on different time periods, with market neutral exposure or other differentiating properties, can offer reliable diversification. By contrast, asset classes with low historical correlation in the past might fool investors. A low correlation during positive market periods is of secondary importance. In periods when recessions, financial crises or other crashes arise, low correlation is demanded. It is often exactly in those instances that risky asset classes turn out to have a very high correlation and move downwards together. By allocating to multiple independent strategies, the simultaneous downward move can be prevented or at least diminished, while upside potential is still available. Why not learn from other disciplines where challenges and risks are similar? Airplanes are built to be reliable because there is a terrifying and simple equation. If the overall system fails the plane will crash. Although the smartest engineers work on airplanes, it is not accepted to develop just one perfect single system to rely on. Despite convincing results from the many tests before live operation, there are too many dangerous external factors that can never be completely anticipated. Hence, planes are constructed to compensate for failing components with error tolerant systems, adaptive software and balancing components. So, why not adopt the approach for portfolios to protect against crashes? Smart beta or any other passive concept only represents components and by no means a complete strategy. For a comfortable flight with a safe landing a reliable, adaptive overall system – an active manager who continuously improves the portfolio diversified over multiple strategies – is required.